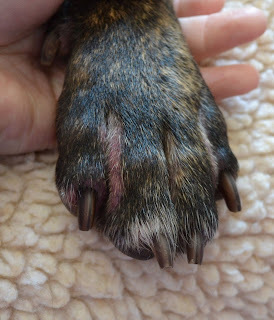 Poor Walker - a vet appointment yesterday confirmed that his Demodectic Mange was not completely cleared up, and has returned after the stress of his arrival. He is now on a monthly treatment, along with 2 weeks (2 x a day) antibiotics. A return appointment in 1 month will be scheduled for another skin scraping. I had first noticed last week that his paws were red and puffy, seemingly overnight. 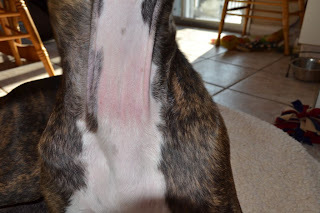 His throat was pink as well (although I chalked that one up to a combination of pulling on his collar and playing bitey-face with my crew). Yesterday morning I noticed his groin/belly seemed quite pink and I drew attention to that. It was that scraping that confirmed the presence of mites. So this (and last weekend's Santa Pix) really confirms that being in public places really isn't the issue for him. The issue is territorial / at home, and so we'll have to deal with that training appropriately. 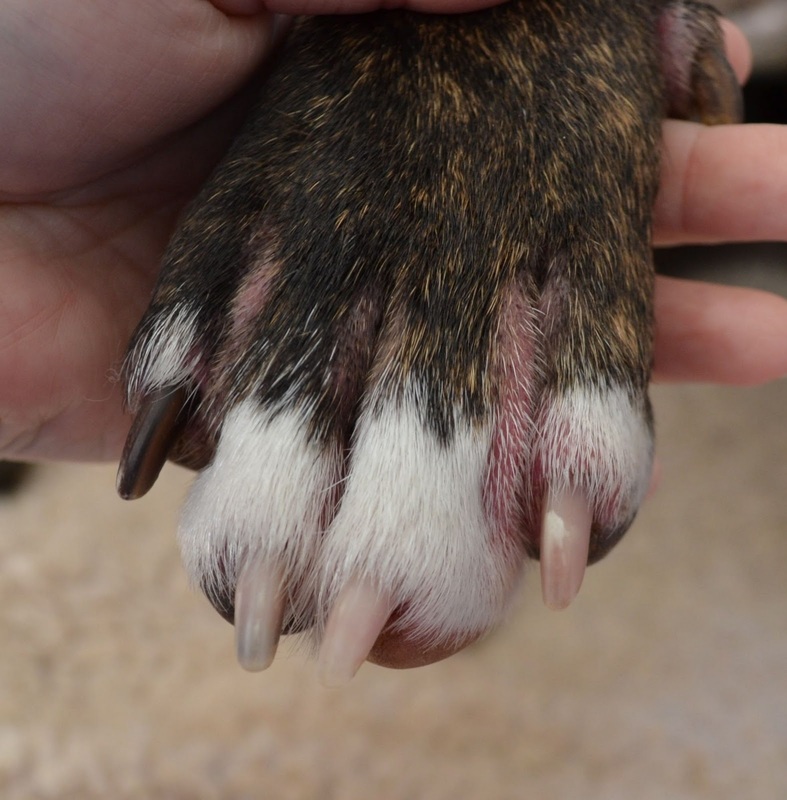 We probably have at minimum another 2 months, while ensuring his demodex is a thing of the past once and for all. Poor pup should never have had to suffer for so long. At least he isn't full of parasites the way my last foster dog, Kyleigh, was while she was suffering from mange. Pictures of his feet and throat after last week's bath, which I sent to the rescue to question if an appointment should be made.